Sigma Iota – Sigma Phi Upsilon for Shanti Bhavan on Wednesday, February 28, 2018 at 7:30 p.m. at Demaray Hall (509 West Bertona Seattle, WA 98119). The fundraiser will include a screening of the new Netflix documentary Daughters of Destiny: The Story of Shanti Bhavan, as well as a Q&A with Shanti Bhavan’s Director of Operations, Ajit George. 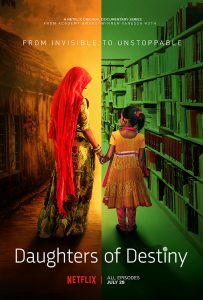 Attendees will also have the chance to purchase copies of The Elephant Chaser’s Daughter, a memoir by Shilpa Raj, a star of Daughters of Destiny. Donations raised at the event will help sponsor a student’s annual tuition and cover the child’s school, housing, clothing and medical expenses. To save your seat, RSVP here. We will see you there! The Netflix original documentary series following the lives of five of our students, Daughters of Destiny, directed by Vanessa Roth with music by A.R. Rahman, was released.